FRANCE – Châlons en Champagne - Des vestiges gallo-romains ont été découverts dans le sous-sol de l'ex-cinéma Bernard-Blier. Réalisé en août dernier, le diagnostic d'archéologie préventive s'est révélé positif. « Des indices d'occupation gallo-romaine ont été découverts sur le site à la suite de deux sondages », explique Antoine Mamie, qui est en charge de l'opération. 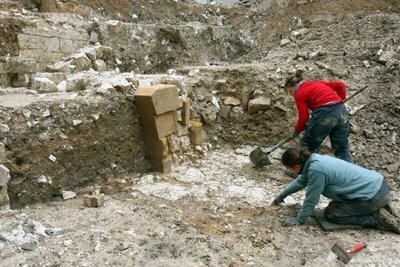 Y trouvant un intérêt tout particulier, le service régional de l'archéologie a ordonné à l'aménageur de procéder à des fouilles. Ce dernier s'en est remis au bureau d'études et de valorisations archéologiques Evéha, qui a dépêché une équipe auboise sur place. Cinq archéologues y officient depuis la mi-décembre. Ont pour l'heure été découverts des restes de caves et de puits, supposés être de la toute fin du Moyen âge. « Il n'y a qu'en étudiant le mobilier trouvé sur place que nous pourrons le confirmer », explique le responsable d'opération. Mieux encore : des pieux datant du 14e siècle ont également été exhumés le long de la rue Lochet. « Nous penchons pour un aménagement des berges du Nau avant qu'il ne soit canalisé », indique Antoine Mamie. « Nous allons poursuivre nos fouilles à cet emplacement, à l'aide de pompes à eau qui nous permettront un accès en sous-sol. Peut-être y trouverons-nous un aménagement des berges datant de l'époque gallo-romaine. L'objectif principal des fouilles, à vrai dire, « dans la mesure où il n'est pas évident d'avoir des données sur cette période à Châlons-en-Champagne ». 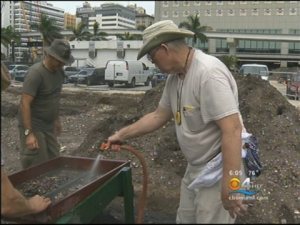 USA – Miami - Among skyscrapers and cranes in Downtown Miami, archaeologists have been quietly working on a secret dig. Bob Carr with the Archaeological and Historical Conservancy finally spilled the details this week on what he’s been so busy doing since November. Carr pointed to a man scraping the bottom of a six foot hole and told CBS4, “He’s at Miami 1000 AD, at that depth and location. Everything he’s finding in that black soil dates back to the Tequesta.” Tequesta, as in Miami’s original Indian inhabitants. He showed off a box full of artifacts complete with an axe, nails, musket ammunition, and a sharks tooth with a perfect hole drilled in it. It appears to be from a necklace. ROYAUME UNI - Butterley Gangroad - The secrets of one of the oldest railway tunnels in the world, between Crich and Bullbridge, are set to be revealed as part of a two-year project. The Derbyshire Archeological Society has been given £17,900 by the national Heritage Lottery Fund to dig at points along the one-and-a-half-mile route known as the Butterley Gangroad to gather information from inside the structure, which was built in 1793. Project leader Trevor Griffin believes the line, engineered by Ripley’s Butterley Company founder Benjamin Outram, will help reveal the history of a fascinating local relic. He said: “It’s got a claim to being the oldest railway tunnel in the world, but it could have been reconstructed at some stage. There’s a lot of these railways in the Ripley area and a lot in the countryside that no-one has done anything with – hopefully this will inspire others to do similar projects.” Railway carraiges were originally pulled by horses and carried limestone from quarries in Crich to the Cromford Canal at Bullbridge. The materials were then taken by boat to the Butterley Works in Ripley via the tunnel, where it was used to make iron. ITALIE – Ciampino - Archaeologists say they've uncovered an "exceptional" group of sculptures dating to the 1st century BC in a villa in Rome's suburb of Ciampino. The sculptures, found in an ancient villa owned by Roman general Marcus Valerius Messalla Corvinus, a patron of the poet Ovid, tell the myth of Niobe, the proud daughter of Tantalus who lost all her 14 children after boasting to the mother of Apollo and Artemis, Leto, about her fertility. Niobe, regarded as a classic example of the retribution caused by the sin of pride or hubris, was turned to stone. Excavations at the villa have also revealed a thermal bath area with fragments of artistic mosaics and a swimming pool as long as 20 meters with walls painted blue. Inside the bath area were found seven sculptures dating to the Augustan age, as well as a complete series of fragments that experts say can be reassembled. The group tells the story of Niobe, which figured in Ovid's epic poem of transformation, the Metamorphoses, published in AD 8. La Repubblica newspaper said Tuesday a team of archaeologists made the valuable discovery last summer. "Statues of Niobe have been found in the past, but in the case of Ciampino, we have a good part of the group," of statues, said Elena Calandra, superintendent of archaeological heritage. According to their reconstruction of the bath area, experts say the statues were carved on all four sides of the swimming pool, which may have been buried by an earthquake in the 2nd century AD. AFRIQUE DU SUD – Pinnacle Point - The archaeological sites at Mossel Bay’s Pinnacle Point have been declared provincial heritage sites. The sites are famed for revealing some of the earliest evidence for modern human behaviour. “Pinnacle Point is significant because it’s a uniquely dense concentration of well-preserved archaeological sites which contain a record of human occupation over a period of about 170 000 years — from the time when modern human behaviour first emerged to the precolonial period,” said Professor Curtis Marean who heads the South African Coastal Palaeoclimate, Palaeoenvironment, Palaeoecology, and Palaeoanthropology (SACP4) Project, which is studying the finds from Pinnacle Point. 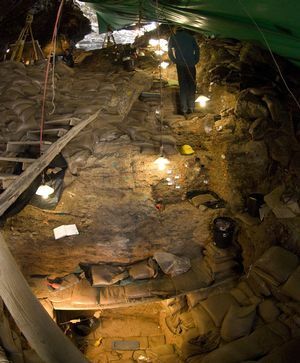 Dr. Peter Nilssen of the Iziko South African Museum revealed a number of stone age sites and evidence that the caves under the sites housed people for tens of thousands of years. He and Professor Marean then studied the site and co-authored a paper titled Early human use of marine resources and pigment in South Africa during the Middle Pleistocene, which was published in Nature in 2007. “We found that the people who lived in the Caves approximately 164 000 years ago were systematically harvesting shellfish from the coast; that they were using complex bladelet technology to produce complex tools; and that they regularly used ochre as pigments for symbolling,” said Professor Marean. PAKISTAN – Lahore - The cold weather has stalled conservation work at the Lahore Fort, say Archaeology Department officials. The department undertook conservation and restoration work on the Picture Wall, Diwane Aam (hall of public audience), Diwane Khaas (hall of special audience), Lal Burj and Kala Burj (red and black towers) and Jehangir’s Quadrangle in 2011. Afzal Khan, the deputy director of the Archaeology Department, told The Express Tribune that the heavy moisture in the air prevented certain materials used in the flooring and in consolidating parts of the old buildings from setting and drying properly. “If the material doesn’t dry properly it can crack open in the summer,” he said. “We will restart the restoration work in February.” The picture wall, which is about 1,500 feet long and 55 feet high, is adorned with murals of Mughal court life and battles. Khan said a small patch of the picture wall is being restored on an experimental basis. It will be replicated on the rest of the wall once the weather changes. The picture wall shields the north-west part of the Fort. The eastern side of the wall was constructed by Mughal emperor Jehangir and the western half by Shah Jehan. It was completed in 1631 AD.